A portion of the pyramids in this installation were first created for F.E.A.S.T. (Funding Emerging Art with Sustainable Tactics) 2017, a public meal designed to use community-driven financial support to democratically fund projects that use art and creative thinking to impact the community. Susanna Lee’s installation is framed by the idea that each individual can be a light to inspire movement within their community. While initially reconstructing hexahedral pyramids, asymmetry and discrepancies within each pyramid arose. Lee holds these differences as symbols of human nature and discouraging encounters. 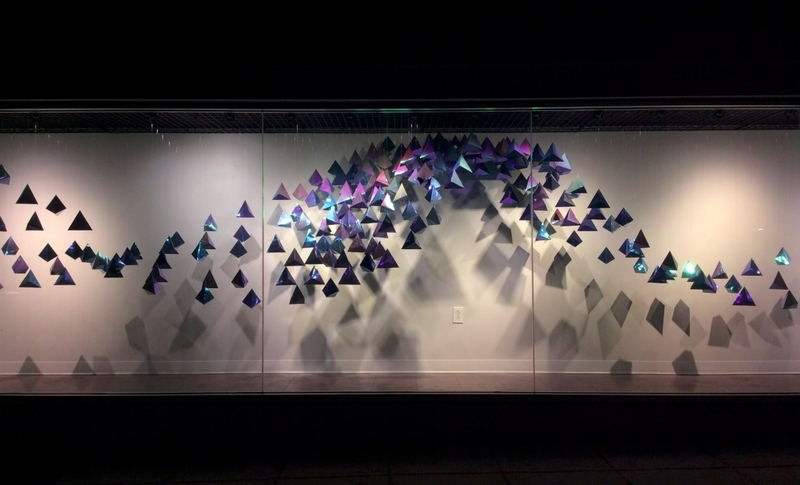 In response, Lee had the support of her family, friends, and VisArts Gallery Staff to create and install hundreds of pyramids for a 70 foot long, glass-walled space. Just as this installation embodies collaboration, each pyramid also has the potential to capture light and reflect back an iridescent form of light. Lee creates value for each individual pyramid to bring about connection and dependency for its complete body. Special thanks to Jeff Baker, Sarah Hodes, Bok Ja Lee, Florence Lin, Susan Main, Frank McCauley, Miguel Resendiz, Anderson Toledo, and Vivian Yeh. About the artist: Susanna Lee is a freelance graphic designer and the Inside Art Coordinator at VisArts, a program that links the public to the ideas and processes of VisArts exhibition and studio artists. She served as intern at VisArts Gallery Department through the Montgomery College Arts Institute from 2016-2017. Susanna Lee received a B.S. in Psychology from the University of Maryland Baltimore County. The 355 Pod Space is a partnership between VisArts and Federal Realty Investment Trust to present five site-specific artist installations through the end of 2018.